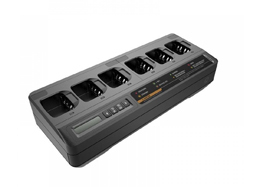 The multi-unit charger incorporates two additional display modes for enhanced display data capabilities. Set-up mode enables the user to customize the charger for their specific use. Options include disabling calibration, battery storage mode and display data customization. Diagnostic mode enables the charger to read IMPRES battery data similar to the IMPRES Battery Reader. Data available includes date of first use, number of charge cycles and capacity detail.